It took the Department of Homeland Security Headquarters Division just nine business days to provide data in response to a simple Freedom of Information Act request sent to it and 20 other federal agencies. The Department of Justice’s Civil Rights Division came through a day later; two days after that, we received data from Justice’s Management Division. Soon, the records from the Fish & Wildlife Service arrived, then the Army, and then the Bureau of Land Management. Earlier this week, data arrived from United States Citizenship and Immigration Services. Now 65 business days after the FOIA requests were sent to the 21 agencies, only those seven have furnished complete and usable records in response. Several others have made good-faith efforts to comply and appear to be working toward providing data. Ten agencies have either failed to respond at all, have become unresponsive at some point in the process, or, in the case of the CIA, have outright denied the request. The FOIA Project has compiled the responses (and lack thereof) from the 21 agencies into a new report (PDF / Below). The requests were sent by the Transactional Records Access Clearinghouse at Syracuse University, which administers the FOIA Project, on the afternoon of Jan. 22, with two of the requests (to the CIA and IRS) going out on the morning of the 23rd. They were submitted via email, fax, or the FOIA Online system, as directed by the agency.The requests to each agency were identical. We asked for copies of the electronic files the FOIA offices themselves use to keep track of FOIA requests. We requested that the records be provided in a CSV, Excel or similar format that retains the structure of the data. The fields requested include tracking number, date request was received, and the date it was closed. The requests were deliberately kept as simple as possible. TRAC purposely did not ask for any information that might be cause for redaction, delay, or difficultly. TRAC sent the requests as part of a new initiative to obtain, post on foiaproject.org, and regularly update data on agency FOIA backlogs and processing times. The FOIA Project’s goal is to document agency compliance with the law, and to highlight both good and bad practices to help foster an atmosphere that leads to greater compliance. Zaid said he was not surprised that the CIA was the one entity that denied the request, which it did on the grounds that it was too difficult a request to fulfill. Additional definitions, notes, and scoring criteria are below. Army March 17 High Good correlation with FOIA.gov reporting. All requested fields included. Original release on March 17 did not include “track” field. Follow up email sent 3/30. Data released with track field on April 2. Bureau of Land Management April 16 High 1/27 letter acknowledged our request, granted us media status, and put the request in BLM’s “normal” request processing track. There was then a long delay without further correspondence, but the data arrived with all fields present and good correlation with FOIA.gov reporting on 4/16. Bureau of Prisons No 1/23 letter informed us it would take 30 days to process our request due to the number of records requested. No correspondence since. CIA No Denied our request on 2/20 saying it required “unreasonable effort.” CIA FOIA officer said during a 3/1 call that retrieving the information constituted “creation of a new record,” which the agency was not required nor inclined to do. This contradicts the law; electronic data are records under FOIA. He asked for this in writing, which we provided 3/12. On 4/7 CIA again denied our request. We are appealing. Customs and Border Patrol No On 4/1 CBP sent a “final response” saying the records were available at www.cbp.gov/foia-monthly-requests-log. However, these records do not provide the FOIA requests current status, cover only 3 of the requested 27 months, are missing several other requested fields, and are PDFs. We are appealing. DEA Feb. 12 Low All fields present, but the case-by-case logs provided contain only half the number of requests as reported on FOIA.gov, leading to low confidence in the data’s completeness. DEA’s response letter helpfully provided the name and direct contact number of a paralegal to answer questions. The paralegal recommended we file a new request that notes our old request so she can research. New request filed 4/13 for corrected data updated through 3/31. DHS HQ Feb. 4 High Good correlation with FOIA.gov reporting. All requested fields included. DOJ Civil Rights Division Feb. 5 Medium Good correlation with FOIA.gov reporting. No request date, only received date. DOJ EOUSA No No response. DOJ Management Division Feb. 9 High Good correlation with FOIA.gov reporting. All requested fields included. DOJ Criminal Division No Request acknowledged 2/19. No further correspondence. DOJ National Security Division No No response. DOJ Office of Information Policy No Request acknowledged 2/20. No further correspondence. EPA No On 1/27 EPA provided us with a link to its FOIA Online logs (http://1.usa.gov/1ENcSPA). However, the site limits data downloads to 2,000 records and doesn’t include the requested closed date. Productive series of conversations with the FOIA office ensued to discuss our problems with the FOIA Online data, and the agency’s problems in querying its in-house database. On 4/16, we received a sample spreadsheet with most of the fields requested, including closing date. EPA asked if such a release would satisfy our request. We said it would, provided the records appeared complete. FBI No Request acknowledged 1/23.Response dated 2/9 (received 2/23) notified us that 2,149 pages of paper records had been located and asked us to confirm that we’d pay copying fees. A 2/24 follow-up call made it clear the files located were not responsive. Besides being on paper, they did not reflect the current status of the requests. In a 3/2 letter, we notified FBI that the files were not responsive, but confirmed willingness to pay copying fees for responsive records. We also appealed the fee-waiver denial. Appeal acknowledged 3/19, the last communication from the agency. Fish & Wildlife Feb. 24 High Good correlation with FOIA.gov reporting. All fields present plus a subject and a status field. (Status distinguishes between “completed” cases, where records were released or denied, and cases “closed” on some other basis.) Helpful FOIA officer answered phone and helped us understand the data. ICE March 10 Very Low Original CD of Feb. 18 was damaged. Replacement CD arrived March 10. It isn’t responsive as it only covers requests received in Dec. 2014. Nonetheless, the data is interesting. It shows requests sent years earlier (one each from 1982 and 2004, several from 2012, nearly 4,000 from 2013) as being “received” – which we take to mean entered into the database – in Dec. 2014. Follow up email sent April 2. Also left voice mail. No response. Appealed on 4/13. IRS No Letter on 2/23 informing us they’ll take until 5/24. Navy March 17 Unrated 2/5 letter informed us release would take more than 20 days. 3/17 release contained a spreadsheet with FY 2013 data from the Navy Headquarters Office, and a link to the FOIA Online system for newer requests. 4/2 call to the Navy FOIA Service Center to investigate was transferred directly to the FOIA officer who processed our request. She said she could not generate what we need from the FOIA Online system herself, much like EPA’s initial response. We’re hopeful that if EPA can furnish a solution it might be a model Navy and other FOIA Online agencies could follow. USCIS April 11 Medium Call by agency on 2/3 for clarification, followed by letter same day granting our fee waiver. Data received 4/22 with a release date of 4/11. Good correlation with FOIA.gov reporting. Missing request date but otherwise looks complete. The ultimate goal of these requests is to receive, validate, and make accessible on foiaproject.org case-by-case data and statistics, regularly updated, on the current backlog, processing and wait times for responses to FOIA requests by the largest federal agencies. Because our requests for this data is standardized, the agencies responses can be compared and evaluated. This both provides additional details about an agency’s performance under FOIA, and provides insight into the handling of administrative FOIA requests by agencies that don’t provide us with the data itself. Agencies were rated as satisfactory if they provided us data that is usable for our research purposes; in other words, it was in a CSV or equivalent format, could be checked against FOIA.gov reporting, and contained the most important fields for analysis. 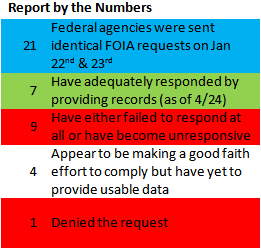 Agencies were rated as unsatisfactory if they (a) failed to respond at all, (b) failed to respond beyond the basic acknowledgement, (c) sent an extension letter but then failed to meet its own deadline, (d) declined the request in violation of FOIA, or (e) provided data that was clearly insufficient and was unresponsive to follow up inquiries. Agencies were not rated (pending) if they have made an effort to communicate with us and work with us constructively but who have not yet provided us with usable data. Annual FOIA reports implicitly require agencies to track all these fields except “date of request.” As a practical matter, an agency typically records this date as well so that it can identify the particular request when it acknowledges its receipt. Accordingly, unless an agency affirmatively stated that the field was not tracked, its omission was penalized. This date can be useful in examining the lag between when a request is sent and when an agency starts its own internal clock for responding to that request. Here’s a copy of the full text of the FOIA request sent to the agencies. The Transactional Records Access Clearinghouse (TRAC), which administers the FOIA Project, is a nonpartisan, nonprofit research center of the Newhouse School of Public Communications and the Whitman School of Management at Syracuse University. Questions about this report? Contact Research Assistant Professor Greg Munno at 315.443.3613 or gjmunno@syr.edu. Missing the BE in this sentence in above story: Now 65 business days after the FOIA requests were sent to the 21 agencies, only those seven have furnished complete and usable records in response. Several others have made good-faith efforts to comply and appear to BE working toward providing data. How were the 21 agencies selected? Just curious…. For the most part we focused on agencies that, according to our analysis of FOIA lawsuit data, get sued frequently under FOIA (http://foiaproject.org/lawsuit/) and/or that have some special significance to FOIA (such as OIP). We’d love to do more and are trying to figure out how to get the capacity to do so. What we really are interested in is the data itself. We’ll soon be rolling out some really cool interactive data tools that utilize the data from the agencies that did comply with the request. So we’d like to both expand this effort to monitor our requests and at the same time get more and more data up from the agencies themselves. Is there a agency you’d like us to put on the list?